﻿ Chriscentville Hotel, Bohol | FROM $33 - SAVE ON AGODA! Have a question for Chriscentville Hotel? 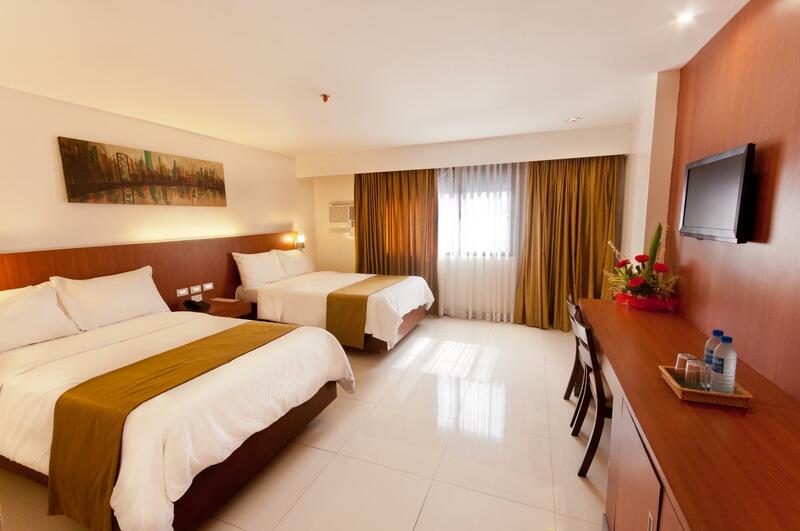 Renovated in 2000, the Chriscentville Hotel guarantees guests a pleasant stay whether in Bohol for business or pleasure. From here, guests can enjoy easy access to all that the lively city has to offer. Visitors to the hotel can take pleasure in touring the city's top attractions: Ramiro Community Hospital, Bohol Quality Mall, Governor Celestino Gallares Memorial Hospital. Take advantage of a wealth of unrivaled services and amenities at this Bohol hotel. The hotel provides free Wi-Fi in all rooms, express check-in/check-out, luggage storage, Wi-Fi in public areas, car park to ensure our guests the greatest comfort. Guests can choose from 24 rooms, all of which exude an atmosphere of total peace and harmony. The hotel offers wonderful recreational facilities such as massage to make your stay truly unforgettable. Whatever your reason for visiting Bohol, the Chriscentville Hotel is the perfect venue for an exhilarating and exciting break away. Everything was below par from the (almost non existent) wifi to the room crawling with ants. The only good thing about the place was the staff. They were great. Pity they had such a poor product to work wth. pros: near the downtown area. their staff are excellent and fast in attending to our needs. cons: no kettle to boil water. i couldnt sterilize milk bottles. Was informed upon checking in that hot water was only sporadically available, often requiring a request at the front desk and a 30 minute wait thereafter. I understand their desire to save electricity on the water heater but was rather inconvenient. No safes in the rooms, and the flimsy metal cabinet behind the front desk they offered as a safe was a joke. Television signal was weak and fuzzy. Toilet seat was hanging on by a thread, and would slide around during use. Breakfast was not a buffet, but an array of choices. The omelet I had was decent enough, but I was expecting an buffet (even a small one) like every other hotel these days. Best thing I can say about this hotel was that the internet was great, even in my room. Other than that, I'd stay in one of the resorts if I ever had to go back to Bohol, PH. Room is big. Water is hot. Location is ok. It is a ok hotel but I would not recommend to my friend. I had a nice stay at this hotel. The food they served was great and the staff was very, very friendly. They took great care of our little daughter while we were dining in the hotel. Staff was helpfull and very friendly. Rooms had comfortable beds but needed some renovation. The location is near Bohol Quality Mall (BQ) and near airport. We choose the Chriscentville Hotel at this time because there was no electricity after the earthquake in Bohol. This was the only Hotel with an 24 H generator. The Hotel Price was very Cheap so we didnt expect much. You have to book a Executive Room to be able to look out the Window. Lower Categories dont have any Windows. There is a good Aircon in the rooms and our executive Room also had a small Televison and a fridge. The Wifi is actually only available in the Lobby and there very strong. In the Rooms you are not able to connect. The Hotel has no Elevator which was no porblem because we had the 1st Floor and the Housekeeping stuff was extremly helpfull. The receptionist are as usual in the Philippines very slow and fairly enthusiastic. Overall we had a good stay there and I would book this hotel again. By the Way there is a free shuttle Service to the Port and Airport from 07:30 - 18:00 I believe. We used it to the Port as we took the Ferry. Everything was very good organized. Good location, affordable and excellent services, friendly and courteous staff. In my week long stay, I felt great and satisfied and look forward to stay again here on my next visit to my business. Had a nice stay even though the wifi not work so well sometimes. Staff is friendly and everything is nearby with some shops open late at night. Stay was fine. The room could be better, but other than that the location is good, the air con is good, the wifi can improve, the staff is friendly and kind. it was quite ok, the staff were accomodating, but the building is old. Time warp to the 60's (?). Reasonably clean, spacious room. We spent 1 night in Chriscentville Hotel in December 2012. We booked 2 rooms: standard and suite. The standard room has no window . The rooms were clean but the maintenance is too poor. The fridge was rusty (see picture) and inside was rotten we asked to changed it. The bathroom in the suite is on picture. Taps are rusty. The plughole (visible on the left side of the bath) is handle by a plastic bag use as a wire... fashion! In both room, electric wires are unsheathed. If the maid and bellboys were helpfull and kind, the reception people were not. This hotel is really old and not cared. It's just clean. We booked (and paid) for 2 nights. We left after the first one. I cannot recommand it to anyone. Their better and cheaper hotel in Tagbilaran. Central, commerces et restaurants, réservations Tours. Le personnel est agréable et c'est occupé de mes Tour et transfers. 저렴한 가격 그리고 없다.. 시티 배편 모두 캔슬.. 그래서 숙박..더럽다..왠만하면 가지말라..